Among the oldest fruits consumed by humans, figs tell a complex and symbolic story in culinary history. Figs sweetened all types of dessert before widespread use of sugar, and still appear as the main ingredient in popular holiday dishes and the commercially venerable Fig Newtons cookie since 1891. High in potassium, iron, fiber, and plant calcium, figs are also used for medicinal purposes as a diuretic and laxative. Ficus carica L., commonly known as the fig, originated in northern Asia Minor and spread with the Greeks and the Romans throughout the Mediterranean region. 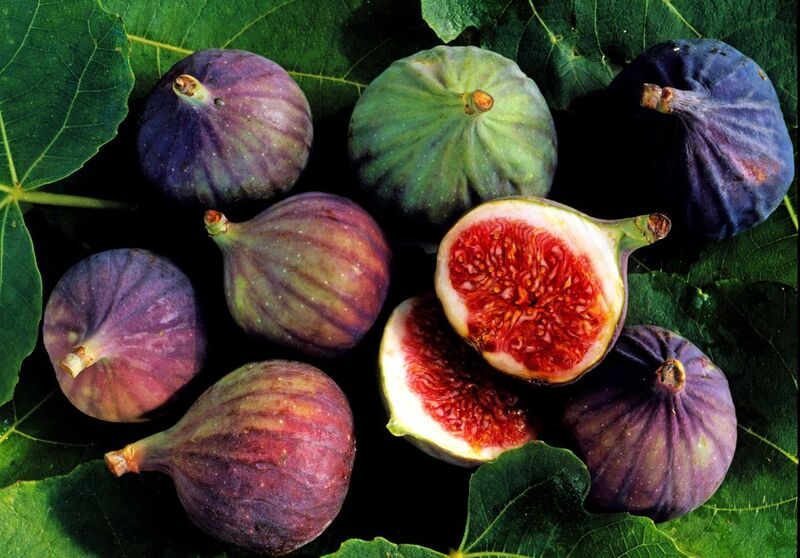 Spanish Franciscan missionaries brought the fig to southern California in 1520, leading to the variety known as the Mission fig. Evidence shows the fig to be in abundance in both China and England by this time as well. The fig tree appears repeatedly in both the Old and New Testament of the Bible (some scholars believe the forbidden fruit picked by Eve was a fig rather than an apple), but it has been cultivated for much longer. Sumerian stone tablets dating back to 2500 B.C. record culinary use of figs, and remains of fig trees were found during excavations of Neolithic sites from 5000 B.C. Some historians consider it the first of the domesticated crops. Figs hold a position of symbolism in many world religions, including Christianity, Islam, Hinduism, Judaism and Buddhism, representing fertility, peace, and prosperity. Ancient Olympians earned figs for their athletic prowess, and Pliny the Elder extolled the fruit's restorative powers. The prophet Mohammed reportedly identified the fig as the one fruit he would most wish to see in paradise. The deciduous fig tree can live as long as 100 years and grow to 50 feet tall, though they more typically stay between 10 to 30 feet. The twisty branches spread wider than the tree height. Figs flourish in hot, dry climates and the fruit requires all-day sun to ripen. Botanically, the fig isn't actually a fruit but a syconium. It's a portion of the stem that expanded into a sac containing flowers that grow internally. The common fig contains only female flowers and propagates without pollination. Other cultivars require pollination. Though there are hundreds of varieties of figs, consumers in the United States can most easily find Black Mission, Brown Turkey, Kadota, and Calimyrna figs. California and Texas produce most of the country's commercial crop, and fresh figs appear in grocery stores throughout the summer months. Dried, canned and frozen figs and packaged fig paste and fig jam are widely available all year long. Oval or pear-shaped figs may be white, green, red or purplish-black and can be eaten raw and whole or grilled. Figs ground into a paste and incorporated into cakes, cookies and other baked goods add moisture and sweetness.